Norway's CycloCable bike escalator allows people to get to and from work without breaking a sweat. Walking or cycling is a great way to save money and live a more sustainable lifestyle. But it can present its own set of problems. This is especially true if you want to walk or cycle to work. If you’ve got any steep inclines or a long distance to cover, you’re likely to end up soaked with sweat by the time you get to where you’re going. This was the exact situation that Jarle Wanvik faced back in 1993. After spending some time arriving to work drenched in sweat and exhausted from the ride, he decided to do something about the most dramatic hill he faced. And so, Norway’s famous bike escalator, or Trampe lift, was born. In 2013, Wanvik’s design was upgraded by the town and renamed the CycloCable. As word spread, it became more than just a way for people to get to and from work. It actually became a tourist destination itself, with people coming from miles away to see – and ride – the famous CycloCable. 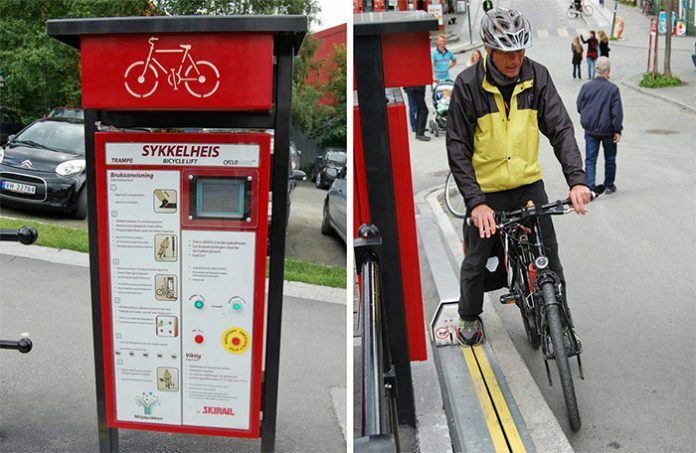 This bike escalator makes it easy for cyclists to get up the hill at Brubakken near Gamle Bybro in Trondheim, Norway. It’s a hill that runs 420 feet-long and climbs at a gradient of between 10 and 18 percent. The CycloCable covers that entire hill, bringing cyclists from the bottom to the top in a matter of minutes, and moving at 5 miles per hour. Since its inception, it’s carried over 200,000 cyclists. The design is simple but innovative. A series of small, metallic plates run along a line up the hill like a miniature ski-lift. A cyclist makes way to the device, puts one foot on the plate, and holds his other foot off the ground. The lift does everything else, carrying the user up the hill with no effort on his part. And though some might be afraid of injury or losing control, in the five years since the redesign, there have been no injuries reported. At any one time, up to five users can take advantage of the CycloCable. And its benefits aren’t limited to bicycles alone. People with scooters and strollers have been known to zip up the hill as well. Norway’s CycloCable is just one more example of how a problem can turn into an opportunity for innovation.